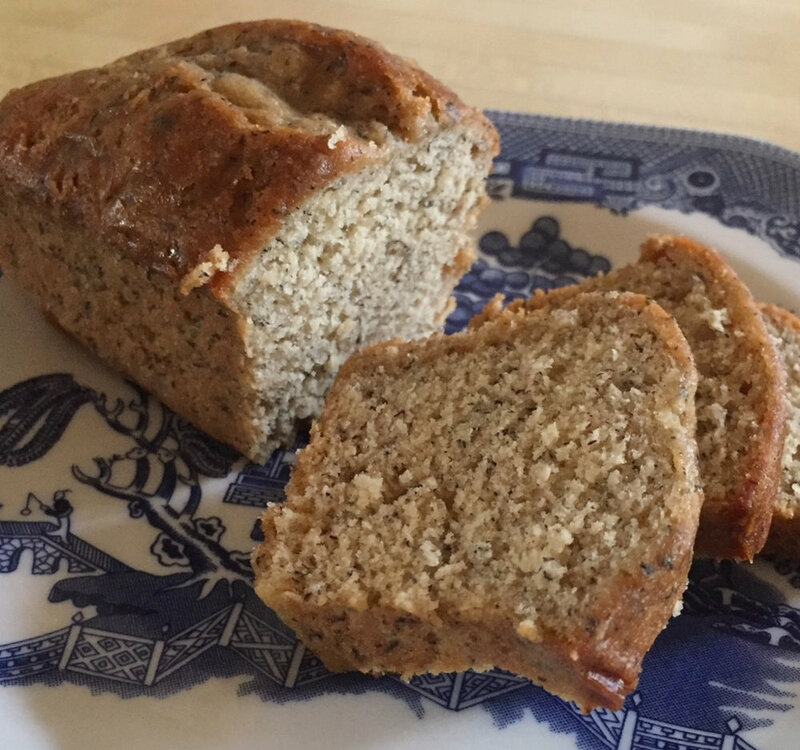 Banana Bread - a breakfast treat. My friend Cami whips up this Banana Bread in minutes following the recipe in the Cuisinart Food Processor Cookbook she got with the purchase of her Cuisinart, This is a very easy recipe to make...even if you don’t have a food processor...see directions below. The Banana Bread comes out sweet and moist. Cuisinart is an award winning maker of kitchen products for professional chefs and home cooks. They introduced the food processor to America in 1973. This multi-use kitchen tool grates, slices, mixes and make food preparation quick and easy. This recipe is well used. Cami even had to add back lost words..
Place metal blade in the food processor. Add butter sugar and eggs to processor. Pulse on and off until ingredients are blended. Add bananas and pulse on and off again until bananas are blended into mixture. Combine flour, baking powder, baking soda and salt, and add gradually to the processor. Pulse on and off, scraping down sides of bowl with a spatula. Do not over process. Process only until flour disappears into the other ingredients. Spoon the mixture into a grease 9x5x3 inch long loaf pan, Bake in a preheated 350-degree oven for 1 hour. Cram butter and sugar together until well blended. Mix in the eggs until they are incorporated then add the ripe bananas and mix well. Set your wet mixture aside. Combine all dry ingredients in a bowl flour, baking powder, baking soda and salt. Add the dry ingredients into the wet a about 1/2 cup at a time until the flour is incorporated. Do not over mix. If you use smaller loaf pans you will bake for about 45 - 55 minutes or until a toothpick comes out clean.